Each atomic element, normally found in its ground state (that is, with its electron configuration corresponding to the lowest state of total energy), can also exist in an infinite number of excited states. These are also ordered in accordance with relatively simple hierarchies determined by the laws of quantum mechanics. The most characteristic signature of these various excited states is the radiation emitted or absorbed when the atom undergoes a transition from one state to another. The systemization and classification of atomic energy levels (spectroscopy) has played a central role in developing an understanding of atomic structure. the branch of physics in which the structure and states of atoms are studied. Atomic physics arose at the turn of the 20th century. In the second decade of the 20th century it was established that the atom consisted of a nucleus and electrons bound together by electrical forces. In the first phase of its development, atomic physics also included problems associated with the structure of the atomic nucleus. In the 1930’s it was shown that the interactions which occur in the atomic nucleus were of a nature different from those which occur in the outer shell of the atom, and in the 1940’s nuclear physics branched off into an independent scientific discipline. In the 1950’s the physics of elementary particles—high-energy physics—also developed as an independent branch. Early history: Study of atoms in the 17th to 19th centuries. Hypothesis concerning the existence of atoms as indivisible particles arose even in antiquity; ideas of atomism were first stated by the ancient Greek thinkers Democritus and Epicurus. In the 17th century, the ideas were revived by the French philosopher P. Gassendi and the English chemist R. Boyle. The concepts of atoms that prevailed in the 17th and 18th centuries were poorly defined. Atoms were considered absolutely indivisible and immutable solid particles whose different types are distinguished by size and form. Combinations of atoms in one or another order produce various substances, and the motions of atoms determine all phenomena that take place in matter. I. Newton, M. V. Lomonosov, and certain other scientists supposed that atoms could combine into more complex particles—“corpuscles.” However, specific chemical and physical properties were not attributed to atoms. The study of atoms still had an abstract, natural-philosophical character. In the late 18th and early 19th centuries, as a result of the rapid development of chemistry, a basis for the quantitative treatment of the study of atoms was created. The English scientist J. Dalton was the first (1803) to consider the atom as the smallest particle of a chemical element, distinguished from atoms of other elements by its mass. According to Dalton, the basic characteristic of the atom is its atomic mass. Chemical compounds are a collection of “combined atoms” which contain a specific (characteristic for a given complex substance) number of atoms of each element. All chemical reactions are mere regroupings of atoms into new compound particles. Starting from these assumptions Dalton formulated his law of multiple proportions. The investigations of the Italian scientists A. Avogadro (1811) and, in particular, S. Canizzaro (1858), drew a sharp line between the atom and the molecule. In the 19th century the optical, as well as the chemical, properties of atoms were studied. It was established that each element had a characteristic optical spectrum; spectral analysis was discovered by the German physicists G. Kirchhoff and R. Bunsen in 1860. In this manner the atom appeared as a qualitatively unique particle of matter, characterized by strictly defined physical and chemical properties. But the properties of the atom were considered eternal and inexplicable. It was assumed that the number of types of atoms (chemical elements) was random and that there was no connection between them. However, it was gradually ascertained that there were groups of elements which had the same chemical properties, the same maximum valence, and comparable laws of variation (in the transition from one group to another) of physical properties—that is, melting point, compressibility, and so on. In 1869, D. I. Mendeleev discovered the periodic system of elements. He showed that the chemical and physical properties of the elements were periodically repeated with an increase in atomic mass (see Figures 1 and 2). The periodic system demonstrated the existence of relationships between the different types of atoms. This suggested the conclusion that the atom has a complex structure that varies with atomic mass. The problem of the discovery of atomic structure became the most important problem in chemistry and physics. Origin of atomic physics. The most important events in science, from which the beginning of atomic physics followed, were the discoveries of the electron and radioactivity. In the investigation of the flow of electric current through highly rarefied gases, rays were discovered which were emitted by the cathode discharge tube (cathode rays) and which had the property of being deflected in transverse electric and magnetic fields. It was ascertained that these rays consist of rapidly moving, negatively charged particles called electrons. In 1897 the English physicist J. J. Thomson measured the ratio of the charge e of these particles to their mass m. It was also discovered that metals, upon intense heating or illumination by light of short wavelength, emit electrons. From this it was concluded that electrons are part of all atoms. Hence, it followed that neutral atoms must also contain positively charged particles. Positively charged atoms (ions) were in fact discovered in the investigation of electrical discharges in rarefied gases. The representation of the atom as a system of charged particles explained, according to the theory of the Dutch physicist H. Lorentz, the very possibility of radiation by the atom of light: electromagnetic radiation arises with the oscillation of intra-atomic charges. This was verified in the study of the influence of a magnetic field on atomic spectra. It was explained that the ratio of the charge of intra-atomic electrons to their mass, elm, found by Lorentz in his theory of the Zeeman effect, is exactly equal to the value for elm for free electrons that was obtained in Thomson’s experiments. The theory of electrons and its experimental verification yielded indisputable proof of the complexity of the atom. chemical element is transmuted into an atom of the element located one position to the right—that is, a bismuth atom becomes polonium. The mass of an atom formed as a result of such transmutations is sometimes found to be different from the atomic weight of the element into whose position it transferred. This indicated the existence of a variety of atoms of the same chemical element with different masses; these varieties were given the name isotopes (that is, atoms that occupied the same place in Mendeleev’s table). Thus, the concept of the absolute identity of all atoms of a given chemical element proved to be incorrect. The results of the investigation of the properties of the electron and radioactivity permitted the construction of detailed models of the atom. In the model proposed by Thomson in 1903, the atom was represented in the form of a positively charged sphere in which were distributed small (in comparison with the atom) negative electrons (see Figure 3). Figure 3. Thomson’s model of the atom. The points denote electrons impregnated in a positively charged sphere. They were held in the atom because the forces of attraction of them by the distributed positive charge were balanced by their forces of mutual repulsion. The Thomson model gave a generally recognized explanation of the possibility of emission, scattering, and absorption of light by the atom. In the displacement of electrons from positions of equilibrium an “elastic” force arose, striving to restore equilibrium; this force is proportional to the electron’s displacement from the equilibrium position and, consequently, to the dipole moment of the atom. Under the influence of the electric forces of the incident electromagnetic wave, the electrons in the atom oscillate at the same frequency as does the electrical field strength in the light wave; the oscillating electrons, in turn, emit light at the same frequency. The scattering of electromagnetic waves by the atoms of matter occurs in this manner. According to the degree of weakening of the light beam in the mass of matter, it is possible to determine the total number of scattering electrons, and knowing the number of atoms per unit volume, it is possible to find the number of electrons in each atom. Formulation of the Rutherford planetary model of the atom. Thomson’s model of the atom proved to be unsatisfactory. On the basis of the model it was not possible to explain the completely unexpected result of the experiments of the English physicist E. Rutherford and his co-workers K. Geiger and E. Marsden on the scattering of alpha-particles by atoms. In these experiments, fast alpha-particles were used for the direct probing of atoms. Passing through matter, the alpha-particles collide with atoms. In each collision the alpha-particle, traveling through the electrical field of the atom, changes its direction of motion—that is, it undergoes scattering. In the overwhelming majority of scattering events, the deflections of alpha-particles (scattering angles) were very small. Therefore, upon passage of a beam of alpha-particles through a thin layer of matter, only a small blowup of the beam took place. However, a very small fraction of the alpha-particles was deflected through angles greater than 90°. This result could not be explained on the basis of the Thomson model because the electrical field in a “solid” atom would not be sufficiently strong to deflect a fast and massive alpha-particle through a large angle. In order to explain the results of experiments on the scattering of alpha-particles, Rutherford proposed a model of the atom that was new in principle and resembled the structure of the solar system; it came to be called the planetary system. It had the following form. In the center of the atom is a positively charged nucleus whose dimensions (∽10-12 cm) are very small in comparison with the dimensions of the atom (∽10-8 cm) but whose mass is almost equal to the mass of the atom. Around the nucleus move electrons, similar to the movement of the planets around the sun; the number of electrons in an uncharged (neutral) atom is such that their total negative charge compensates (neutralizes) the positive charge of the nucleus. The electrons must move around the nucleus, or they would fall into it under the influence of the attractive forces. The difference between the atom and the planetary system consisted in the fact that gravitational forces operated in the latter and electrical (Coulomb) forces operated in the atom. Near the nucleus, which could be considered as a point of positive charge, there existed a very strong electrical field. Therefore, in passing close to the nucleus, positively charged alpha-particles (helium nuclei) were subjected to a strong deflection. Subsequently it was explained by G. Moseley that the charge of the nucleus increased from one chemical element to another by the elementary unit of charge, equal to the charge of the electron but with a positive sign. Numerically, the charge of the atomic nucleus, expressed in units of elementary charge e, is equal to the ordinal number of the corresponding element in the periodic system. In order to check the planetary model, Rutherford and his co-worker C. G. Darwin calculated the angular distribution of alpha-particles scattered by a point nucleus—the center of the Coulomb forces. The result obtained was checked by experimental means—the measurement of the number of alpha-particles scattered through various angles. The results of the experiment agreed exactly with the theoretical calculations, brilliantly confirming the Rutherford planetary model of the atom. However, the planetary model of the atom encountered fundamental difficulties. According to classical electrodynamics, a charged particle which is moving under acceleration continuously radiates electromagnetic energy. Therefore, electrons moving around the nucleus—that is, under acceleration—must be continuously losing energy by radiation. But in this case they would, in a negligibly small fraction of a second, lose all their kinetic energy and fall into the nucleus. Another difficulty, also connected with radiation, was that if it is assumed (in correspondence with classical electrodynamics) that the frequency of the light radiated by the electron is equal to the frequency of the electron’s oscillations in the atom (that is, the number of revolutions performed by it along its orbit in one second) or a multiple of it, then the radiated light, according to the degree of approach of the electron to the nucleus, must continuously change its frequency and the spectrum of the light radiated by it must be continuous. This, however, is contradicted by the experiments. The atom radiates light waves of completely fixed frequency, typical of a given chemical element, and is characterized by a spectrum which consists of individual spectral lines—a line spectrum. 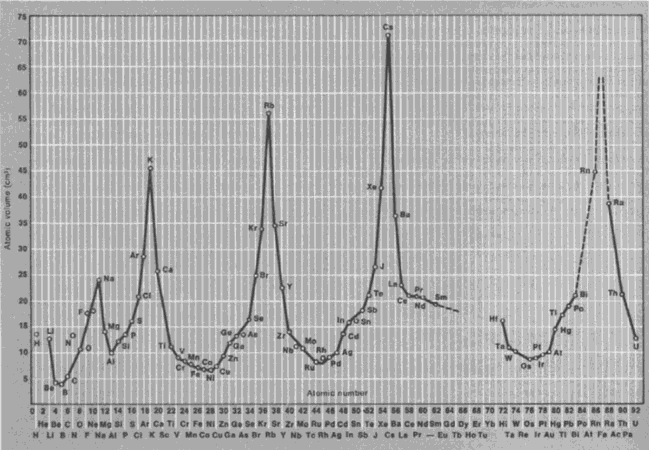 In the line spectra of the elements a series of regularities were experimentally established, the first of which was discovered by the Swiss scientist J. Balmer (1885) in the hydrogen spectrum. The most general rule, the combination principle, was found by the Austrian scientist W. Ritz in 1908. This principle can be formulated in this manner: for the atoms of each element, it is possible to find a sequence of numbers T1, T2, T3,... of so-called spectral terms such that the frequency v of each spectral line of a given element is expressed in the form of the difference of two terms— v = Tk –Ti. For the hydrogen atom, the term is Tn = Rin2, where n is an integer that takes on the value n = 1, 2, 3, ... and R is the so called Rydberg constant. Thus, within the limits of the Rutherford model of the atom, the stability of the atom in relation to radiation and the line spectrum of its radiation could not be explained. On the basis of the model, neither the laws of thermal radiation nor the laws of photoelectric phenomena, which arise in the interactions of radiation with matter, could be explained. It became possible to explain these laws by proceeding from completely new—quantum—concepts first introduced by the German physicist M. Planck in 1900. For the derivation of the law of energy distribution in the spectrum of thermal radiation (the radiation of heated bodies), Planck proposed that the atoms of matter emitted electromagnetic energy (light) in the form of individual portions (quanta of light) whose energy is proportional to v (the frequency of the radiation): E = hv, where h is a constant—characteristic for quantum theory—called Planck’s constant. In 1905, A. Einstein gave a quantum explanation of photoelectric phenomena according to which the energy of the quantum hv is used for the emission of the electron from the metal, for the work function P, and for imparting to the electron a kinetic energy Tkin—hv = P + Tkin. Here Einstein introduced the concept of light quanta as a special kind of particle; these particles were subsequently called photons. The inconsistencies of the Rutherford model could be resolved only by rejecting a number of customary concepts of classical physics. The most important step in the construction of atomic theory was made by the Danish physicist N. Bohr in 1913. (1) Existence of stationary states: The atom does not radiate and is stable only in certain stationary (unchanging in time) states which correspond to a discrete (discontinuous) sequence of “permitted” values of the energy E1, E2, E3, E4..... Any change in energy is associated with a quantum transition (jump) from one stationary state to another. (2) Condition for radiation frequencies (quantum transitions with radiation): In the transition from one stationary state with energy Ei to another with energy Ek the atom emits or absorbs light of a specific frequency v in the form of a quantum of radiation (photon) hv according to the relation hv = E1 • Ek. In emission the atom passes from a state with higher energy E1 to a state with lower energy Ek; in absorption, on the other hand, it passes from a state with lower energy Ek to a state with higher energy E1. The Bohr postulates permit immediate understanding of the physical meaning of the Ritz combination principle (see above); comparison of the relations hv = Ei- Ek and v = Tk- T1 indicates that the spectral terms correspond to stationary states and that the energies of the latter must be equal (with accuracy up to a constant term) to Ei = -hTi, Ek = -hTk. In emission or absorption of light, the atom’s energy changes; this change is equal to the energy of the emitted or absorbed photon—that is, the law of conservation of energy holds. The line spectrum of the atom is a result of the discreteness of its possible energy values. For the determination of the permitted energy values of the atom—the quantization of its energy—and for the calculation of the characteristics of the corresponding stationary states, Bohr applied classical (Newtonian) mechanics. “If we wish in general to compose a visual representation of stationary states, we have no other means, at least now, than ordinary mechanics,” Bohr wrote in 1913 (Tri stat’i o spektrakh i stroenii atomov, p. 22, Moscow-Petrograd, 1923). For the simplest atom—the hydrogen atom, which consists of a nucleus with charge +e (a proton) and an electron with charge -e —Bohr considered the motion of the electron around the nucleus along circular orbits. Comparing the energy of the atom E with the spectral terms Tn = R/n2 for the hydrogen atom found with high accuracy from the frequencies of its spectral lines, Bohr obtained the possible values of the atom’s energy, En= - hT n= - hR/n2 (where n = 1, 2, 3, . . .). The values correspond to circular orbits of radius an = a0 n2, where a0 = 0.53 x 10-8 cm—the Bohr radius—is the radius of the smallest circular orbit (for n = 1). Bohr calculated the frequencies of revolution vn of the electron around the nucleus along circular orbits in relation to the electron’s energy. 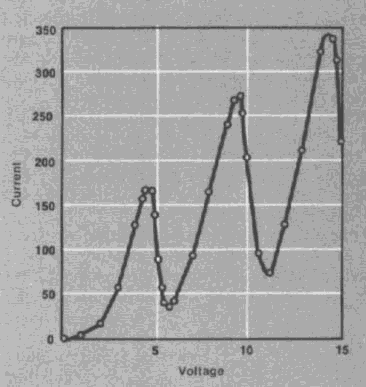 It turned out that the frequencies of the light radiated by the atom did not coincide with the frequencies of revolution vn as required by classical electrodynamics, but rather were proportional—according to the relation hv = Ei - E k—to the energy difference of the electron in two of its possible orbits. For the calculation of the connection between the frequency of the electron’s revolution along an orbit and the radiation frequency, Bohr made the assumption that the results of the quantum and classical theories must agree for small radiation frequencies (for large wavelengths; such agreement occurs for thermal radiation, the laws of which were derived by Planck). For large n, Bohr equated the frequency of transition v = (En+1 - En)/h to the frequency of revolution vn along an orbit with given n and calculated the value of the Rydberg constant R, which agreed to a high accuracy with the value of R found experimentally, thus confirming Bohr’s hypothesis. Bohr succeeded not only in explaining the hydrogen spectrum, but also in conclusively demonstrating that certain spectral lines which were attributed to hydrogen belonged to helium. Bohr’s hypothesis that the results of the quantum and classical theories must agree in the limiting case of small frequencies of radiation represented the original form of the so-called correspondence principle. Subsequently, Bohr successfully applied it for the calculation of spectral line intensity. As the development of modern physics indicated, the correspondence principle was found to be very general. In the Bohr theory of the atom, energy quantization—that is, the calculation of its possible values—was found to be a particular case of the general method of calculating “permitted” orbits. According to the quantum theory, such orbits are only those for which the angular momentum of the electron in the atom is an integral multiple of h/2п. To each permitted orbit there corresponds a specific possible value of the atom’s energy. The basic assumptions of the quantum theory of the atom—the two Bohr postulates—were totally confirmed experimentally. Particularly graphic support was given by the experiments of the German physicists G. Franck and H. Hertz (1913–16). The essence of these experiments is as follows. A beam of electrons whose energy could be controlled enters a vessel containing mercury vapor. Gradually increasing energy is imparted to the electrons. As the energy of the electron is increased, the current in a galvanometer connected to an electrical circuit increases. When the energy of the electrons becomes equal to specific values (4.9; 6.7; 10.4eV), the current decreases sharply (see Figure 4). At this moment the mercury vapor is observed to emit ultraviolet rays of a specific frequency. The stated facts permit only one interpretation. As long as the energy of the electrons is less than 4.9 eV, the electrons do not lose energy upon collision with mercury atoms—the collisions have an elastic character. When the energy becomes equal to a specific value, namely 4.9 eV, the electrons transmit their energy to the mercury atoms, which then emit it in the form of quanta of ultraviolet light. Calculation demon strates that the energy of these photons is exactly equal to the energy lost by the electrons. These experiments proved that the internal energy of the atom can have only specific discrete values, that the atom absorbs energy from without and emits it immediately in whole quanta, and finally, that the frequency of the light radiated by the atom corresponds to the energy lost by the atom. The subsequent development of atomic physics showed the correctness of the Bohr postulates not only for atoms, but also for other microscopic systems—for molecules and for atomic nuclei. These postulates must be considered as firmly established empirical quantum laws. They compose that part of the Bohr theory which was not only preserved in the further development of quantum theory, but which also received its justification. The situation is somewhat different for the Bohr model of the atom, which is based on consideration of the motion of electrons in the atom according to the laws of classical mechanics, with the imposition of the additional conditions of quantization. Such an approach permitted the attainment of an entire series of important results but was inconsistent: the quantum postulates were added artificially to the laws of classical mechanics. A systematic theory was created in the 1920’s; this was called quantum mechanics. Its formulation was prepared by the further development of the model representations of Bohr’s theory, in the course of which its strong and weak sides were investigated. Development of the model theory of Bohr’s atom. A very important result of the Bohr theory was the explanation of the hydrogen atom spectrum. The next step in the development of the theory of atomic spectra was made by the German physicist A. Sommerfeld. Having worked out in more detail the rules of quantization, starting from a more complex picture of the motion of electrons in the atom (along elliptical orbits) and taking into account the shielding of the outer (so-called valence) electron in the field of the nucleus and inner electrons, Sommerfeld was able to give an explanation of a number of regularities of the spectra of alkaline metals. The theory of Bohr’s atom shed light on the structure of the so-called characteristic spectra of X-ray radiation. The X-ray spectra of atoms, in the same way as their optical spectra, have a discrete line structure characteristic of a given element (hence the designation). By investigating the characteristic X-ray spectra of various elements, the English physicist G. Moseley discovered this rule: the square roots of the frequencies of the radiated lines increase uniformly from element to element over the whole Mendeleev periodic system in proportion to the atomic number of the element. It is interesting that the Moseley law completely confirmed the correctness of Mendeleev, who in certain cases violated the principle of arrangement in the table according to increasing atomic weight and who placed certain heavier elements before lighter ones. On the basis of Bohr’s theory, it also became possible to give an explanation of the periodicity of the properties of atoms. In a complex atom electron shells are formed which are filled sequentially, beginning from the innermost, by specific numbers of electrons. (The physical principle of the formation of the shells became clear only on the basis of the Pauli principle; see below.) The structure of the outer electron shells is repeated periodically, which determines the periodic recurrence of the chemical and many physical properties of the elements which are located in the same group of the periodic system. On the basis of the Bohr theory, the German chemist W. Kossel in 1916 explained the chemical interactions in the so-called heteropolar molecules. However, far from all of the questions of atomic theory were successfully explained on the basis of the model representations of the Bohr theory. The theory was not able to deal with many problems of the theory of spectra; it made it possible to obtain correct values for the frequencies of the spectral lines of only the hydrogen and hydrogenlike atoms. The intensities of these lines remained unexplained; for the explanation of the intensities, Bohr was forced to use the correspondence principle. In going over to the explanation of the motions of electrons in atoms more complex than the hydrogen atom, the Bohr model theory found itself up a blind alley—the helium atom, in which two electrons move around the nucleus, did not yield a theoretical interpretation based on it. The difficulties in this case were not confined to quantitative experimental discrepancies. The theory was also useless in the solution of a problem such as the combining of atoms into a molecule. Why were two neutral hydrogen atoms combined into a hydrogen molecule? How can the nature of valence be explained in general? What links the atoms of a solid? These questions remained unanswered. Within the limits of the Bohr model it was impossible to find an approach to their solution. The quantum mechanical theory of the atom. The limitation of the Bohr model of the atom was based on the limitation of the classical representations of the motion of microparticles. It became clear that for the subsequent development of atomic theory it was necessary to critically reconsider the basic concepts of the motion and interaction of microparticles. The unsatisfactory nature of the model based on classical mechanics with the addition of quantization conditions was clearly understood by Bohr himself, whose views exerted a great influence on the further development of atomic physics. The beginning of the new stage in the development of atomic physics was the idea stated by the French physicist L. de Broglie in 1924 concerning the dual nature of the motion of microobjects, in particular of the electron. This idea became the point of departure of quantum mechanics, formulated in 1925–26 in the papers of W. Heisenberg and M. Born (Germany), E. Schrodinger (Austria), and P. Dirac (England), and of the modern quantum mechanical theory of the atom developed on the basis of it. The concepts of quantum mechanics concerning the motion of the electron (of a microparticle in general) differ radically from classical concepts. According to quantum mechanics, the electron does not move along a trajectory (orbit) as a solid ball does; the motion of the electron also exhibits certain properties which are characteristic of wave propagation. On the one hand, the electron always behaves (for example, in collisions) like a unified whole, like a particle which has indivisible charge and mass; at the same time electrons with a specific energy and momentum propagate like a plane wave that has a specific frequency (and wavelength). The energy E of the electron as a particle is associated with a frequency v of an electron wave by the relation E = hv, and its momentum p, with a wavelength λ by the relation p = h/λ. Stable motions of the electron in an atom, as shown by Schrödinger (1926), are in certain respects analogous to standing waves, whose amplitudes differ at different points. In addition, in the atom, as in an oscillatory system, only certain “allowed” motions with specific values of energy, angular momenta, and projections of moments of the electron in the atom are possible. Each stationary state of the atom is described by means of a certain wave function which is a solution of a wave equation of a particular type—the Schrödinger equation; an “electron cloud,” which (on the average) characterizes the distribution of electron charge density in the atom, corresponds to the wave function. In the 1920’s and 1930’s approximate methods of calculating the distribution of electron charge in complex atoms were developed—in particular, the Thomas-Fermi method (1926, 1928). This quantity and the value of the so-called atomic factor connected with it are important in the investigation of electron collisions with atoms and their scattering of X-rays. On the basis of quantum mechanics, the accurate calculation of the energies of electrons in complex atoms by means of the Schrödinger equation was successfully carried out. The approximate methods of such calculations were developed in 1928 by D. R. Hartree (England) and in 1930 by V. A. Fock (USSR). 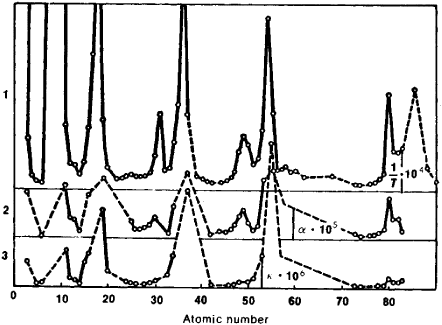 Investigations of atomic spectra completely confirmed the quantum mechanical theory of the atom. In addition, it was explained that the state of an electron in an atom depends essentially on its spin—the intrinsic mechanical angular momentum. An explanation was given of the effect of external electric and magnetic fields on the atom. An important general principle connected with electron spin was discovered by the Swiss physicist W. Pauli (1925): according to his principle, in each electron state in the atom it is possible to find only one electron; if the given state is already occupied by an electron, then the next electron entering into the composition of the atom is forced to occupy some other state. On the basis of the Pauli principle, the capacity of electron shells in complex atoms, which determines the periodicity of the properties of elements, was finally established. Starting from quantum mechanics, the German physicists W. Heitler and F. London in 1927 put forth a theory of the so-called homeopolar chemical bonds of two identical atoms (for example, the atoms of hydrogen in the H2 molecule), which cannot be explained within the framework of the Bohr model of the atom. Important applications of quantum mechanics in the 1930’s and later were the investigations of bound atoms, which form molecules or crystals. The states of atoms which are part of a molecule are essentially different from the states of a free atom. Significant changes are also undergone by an atom in a crystal under the influence of intracrystalline forces, the theory of which was first worked out by H. Bethe in 1929. By studying these changes, it is possible to establish the character of the interactions of the atoms with its environment. The greatest experimental achievement in this area of atomic physics was the discovery by E. K. Zavoiskii in 1944 of electron paramagnetic resonance, which afforded the possibility of studying the different types of bonding associations of atoms with their environment. Modern atomic physics. The basic branches of modern atomic physics are the theory of the atom, atomic (optical) spectroscopy, X-ray spectroscopy, radio spectroscopy (which also investigates the rotational levels of molecules), and the physics of atomic and ion collisions. The various branches of spectroscopy encompass different frequency ranges of radiation and, correspondingly, different energy ranges of quanta. Whereas X-ray spectroscopy investigates the radiation of atoms with quantum energies up to hundreds of thousands of eV, radio spectroscopy deals with very small quanta—down to quanta of less than 10-6 eV. The most important problem of atomic physics is the detailed determination of all the characteristics of atomic states. The question concerns the determination of the possible values of the atom’s energy (its energy levels), the values of the angular momenta, and other quantities that characterize the states of the atom. The fine and hyperfine structures of the energy levels and changes of the energy levels under the influence of electrical and magnetic fields—both external (macroscopic) and internal (microscopic)—are investigated. Such a characteristic of the states of the atom as the lifetime of an electron at an energy level has great significance. Finally, great attention is paid to the mechanism of excitation of atomic spectra. The fields of the phenomena which are studied by the different branches of atomic physics overlap. X-ray spectroscopy by measurement of the emission and absorption of X rays permits the determination for the most part of the binding energy of inner electrons with the atomic nucleus (ionization energy) and the distribution of the electric field within the atom. Optical spectroscopy studies the set of spectral lines which are emitted by atoms, and determines the characteristics of the atomic energy levels, the intensities of spectral lines and lifetimes of the atom in excited states associated with them, the fine structure of energy levels, and their displacement and splitting in electric and magnetic fields. Radio spectroscopy investigates in detail the width and shape of spectral lines, their hyperfine structure, shifting and splitting in a magnetic field, and intra-atomic processes in general which are caused by very weak interactions and influences of media. The analysis of the results of the collisions of fast electrons and ions with atoms affords the possibility of obtaining information about the electron charge density distribution (“electron cloud”) within the atom, the excitation energies of atoms, and ionization energies. The results of the detailed study of the structure of atoms find their broadest application not only in many branches of physics, but also in chemistry, astrophysics, and other fields of science. On the basis of the investigation of the broadening and displacement of spectral lines, it is possible to determine local fields in the medium (liquid, crystal) which cause these changes and the state of this medium (temperature, density, and others). Knowledge of the distribution of electron charge density in an atom and its variations during external interactions permits the prediction of the type of chemical bonds which the atom can form and the behavior of an ion in a crystalline lattice. Information concerning the structure and characteristics of atomic and ion energy levels is extremely important for quantum electronic devices. The behavior of atoms and ions during collisions—their ionizations, excitation, and charge exchange—is important for plasma physics. Knowledge of the detailed structure of atomic energy levels, particularly multiple-ionized atoms, is important for astrophysics. Thus, atomic physics is closely connected with other branches of physics and other natural sciences. The concepts of the atom which have been developed in atomic physics also have great significance for man’s Weltanschauung. The “stability” of the atom explains the stability of various types of matter and the immutability of the chemical elements under natural conditions—for example, under ordinary atmospheric temperature and pressure found on the earth. The “plasticity” of the atom—the variation of its properties and states during the variation of the external conditions under which it exists—explains the possibility of forming more complex systems which are qualitatively unique and their ability to take on various forms of internal organization. Thus a solution is found for the conflict between the idea of immutable atoms and the qualitative diversity of substances—a conflict which has existed both in ancient and in modern times and which has served as the basis for the criticism of atomism. Shpol’skii, E. V. Atomnaia fizika, 5th ed., vol. 1. Moscow, 1963. The science concerned with the structure of the atom, the characteristics of the elementary particles of which the atom is composed, and the processes involved in the interactions of radiant energy with matter. Two years ago a survey of high school physics textbooks in Japan was conducted to see how Nagaoka and his contribution to the early stage of atomic physics were described during the last 50 years. Serge Haroche, who was awarded the Nobel Prize in Physics back in 2012 for his work on atomic physics and proving quantum decoherence. And since a "test" in geophysics is so different from one in atomic physics, it makes even less sense to use a single phrase to explain all scientific explorations. In addition to work in atomic physics, he established the Bio-X program, which focuses on interdisciplinary research in biology and medicine. He successfully applied the techniques he developed in atomic physics to molecular biology, and since 2004, motivated by his deep interest in climate change, he has recently led the Lawrence Berkeley National Lab in pursuit of new alternative and renewable energies. Atomic physics and radioactivity had already made sense of the Sun's power and longevity, and had turned Earth's rocks into clocks. Revising earth's biography: how much of our current "knowledge" will turn out to be wrong? To the scientists immersed in atomic physics, chain-reaction fission almost immediately suggested military applications. He was a faculty member in the Physics Department at Holy Cross College since 1961, where he was a devoted teacher and did basic research in atomic physics. The prototype device could replace tabletop-sized instruments used for laser calibration in atomic physics research, could better stabilize optical telecommunications channels, and perhaps could replace and improve on the precision of instrumentation used to measure length, chemicals or atmospheric gases. The three researchers--Jerrold Marsden of the California Institute of Technology, a mathematician; Shane Ross of the University of Southern California, an engineer; and Turgay Uzer of the Georgia Institute of Technology, a physicist-are all specialists in atomic physics. Post-Hiroshima atomic physics captured his soaring imagination, too, producing giant, sky-bound heads that explode in a whirlwind of infinite particles. About the authors: Antoine Weis is full professor at the Physics Department of the University of Fribourg and leader of the Fribourg Atomic Physics group (FRAP) at the Physics Department of the University of Fribourg, Stephan Groeger and Georg Bison are Ph.